You’re starving. The kids are starving. It’s way past lunch and you haven’t even thought about dinner. You open up the cupboard and…all you see are ingredients. Uh oh. Healthy Snacks To Go to the rescue! 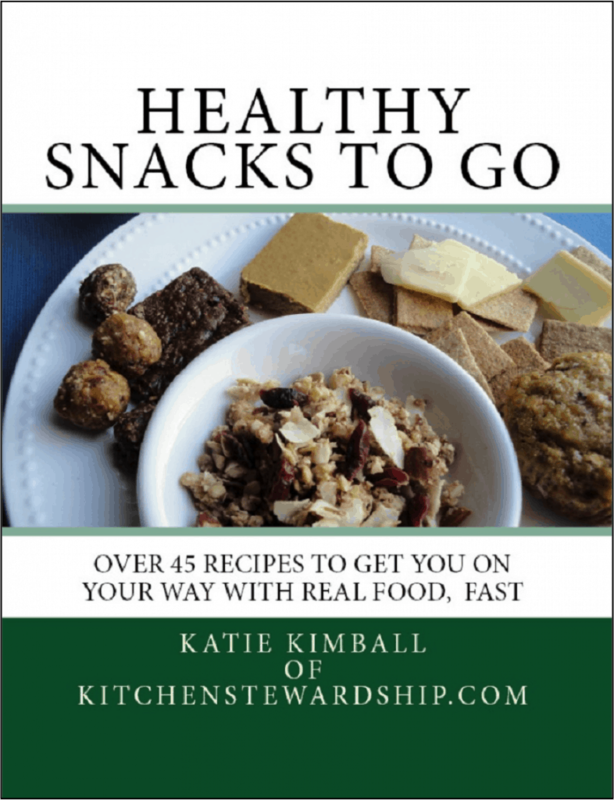 With over 45 healthy snack recipes and ideas including traditional granola bars, iron-packed Popeye bars, and 15 “larabar” style variations, Kitchen Stewardship’s new Healthy Snacks To Go is the resource you need for healthy snack ideas. Complete with time-saving tips, frugal options and allergy notes, Healthy Snacks To Go will become your “go-to” cookbook to keep your cupboards filled with nourishing yet quick choices. Grain-based recipes include soaked versions, and you’ll find healthy fats like butter and coconut oil throughout, plus many more grain-free options in the new edition. When you’re trying to avoid processed food, coming up with something quick can be a challenge. Healthy Snacks To Go features diaper-bag friendly snacks that are toddler-approved and will help your household be prepared for the classic call of, “Mom, I’m huuuuungry!” You’ll also find sophisticated recipes like Wheat Thin Style Crackers and Spelt Biscuits, along with two bonus sections: “Basic Snacks for the Absent-Minded Eater” and “Reduced Waste Health Lunch Packing Tips”. What’s Inside Healthy Snacks To Go? 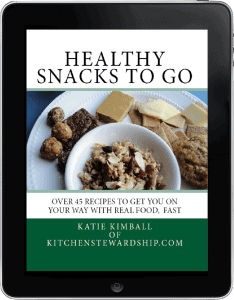 Here is a sample of Healthy Snacks To Go, including two recipes you can have for free! View the table of contents and get a feel for how to book is laid out, and you’ll see that it will certainly become indispensable in your kitchen. Kindle, Nook and PDF files all included! Take your Healthy Snacks… on the go! Some people might wonder why you’d bother to pay for recipes when there are so many free on the Internet. I’d sure like to think that I can save you money. 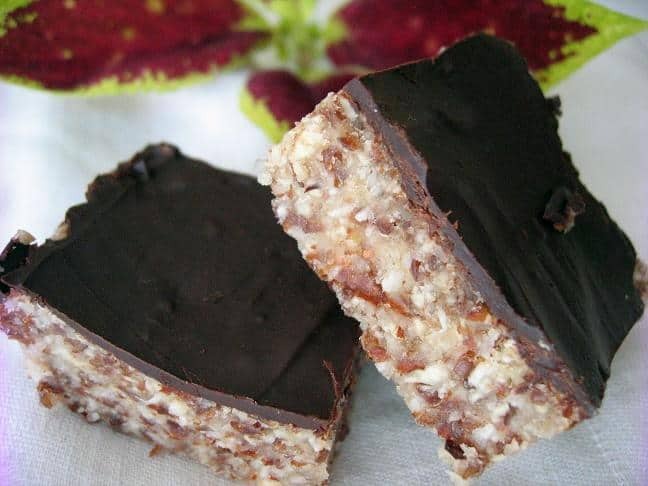 In fact, if you make just a few batches of the famous power bars, packed with expensive ingredients like dried fruit and nuts, you’ll save the purchase price of the book vs. buying individual Larabars. A couple batches of homemade Wheat Thins, and you’ll not only have a much healthier end product, but a few bucks still in your pocket as well. I won’t hide the fact that about a third of the recipes are posted right here at Kitchen Stewardship; another handful have been adapted from other recipes on the web. You could trawl the Internet to find good snacks…but they won’t be as thorough or easily accessible and printable as an eBook. I take great pains to make my eBooks user-friendly and practical, even putting all the photos on three pages so you can save printer ink. I even added a new section on how to substitute coconut, if you’re one of those people who just don’t like it. Real food on the go is one of the trickiest feats in mastering a whole foods diet. Fifteen Power Bar variations! (reverse engineered Larabars) You’re bound to find one (or more) that you’ll love! The recipes are delicious, not intimidating, and often capable of hanging out in your diaper bag or desk drawer to wait until you’re hungry. Easily printable recipes ready to go right into your meal planning or recipes binder. Allergy and special diet friendly: Two-thirds of the recipes are grain-free and sweetener-free, so very friendly to some tough diets like the Specific Carbohydrate Diet. Almost all have gluten-free and/or dairy-free adaptations as well, denoted by simple icons. Over 45 recipes and not one package in sight. Most of the recipes will save you money in the long run. Buying a blogger’s product is an easy way to say “Thank you” for providing the rest of her work free of charge via daily posts. Five Bonus Sections: Basic Snacks Checklist, Soaking Grains Primer, The Snack Bar Manifesto, Yogurt Variations, and Sanity-Saving Lunch Packing Tips.